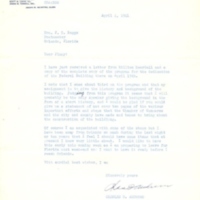 A letter from Charles O. Andrews (1877-1946) to the Orlando Postmaster, James D. Beggs, Jr. Sen. 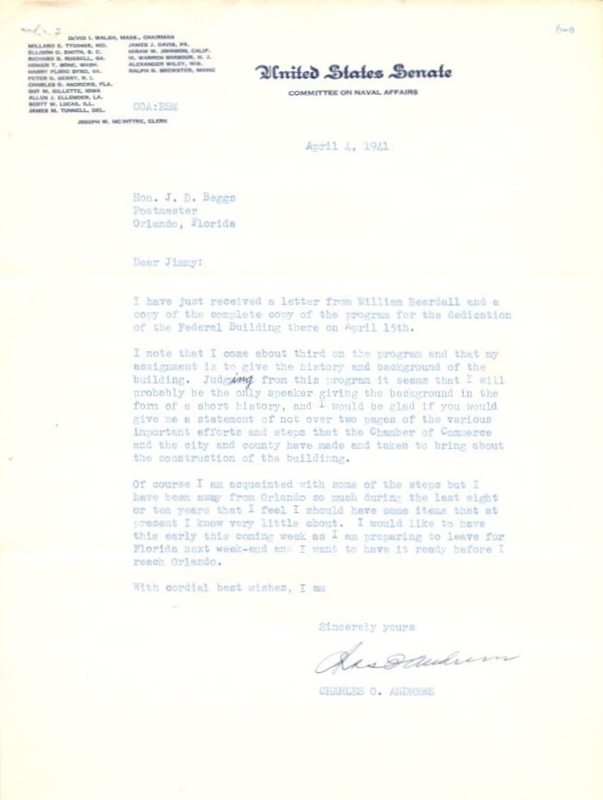 In the letter, Sen. Andrews requests a brief history of the Downtown Orlando Post Office. He planned to use said information to present that the dedication ceremony for the new building. Original letter from Charles O. Andrews to J. D. Beggs, April 4, 1941: Private Collection of Texann Ivy Buck. "Letter from J. D. Beggs to Senator Charles O. Andrews (April 7, 1941)." RICHES of Central Florida. https://richesmi.cah.ucf.edu/omeka/items/show/7611. Originally created by Charles O. Andrews. Billy Beardall; Charles O. Andrews; Charles Oscar Andrews; courthouses; Downtown Orlando; Downtown Orlando Post Office; Greater Orlando Chamber of Commerce; J. D. Beggs; James D. Beggs, Jr.; orlando; post offices; William Hamer Beardall, Jr.
Andrews, Charles O.. “Letter from Charles O. Andrews to James D. Beggs, Jr. (April 4, 1941).” RICHES of Central Florida accessed April 24, 2019, https://richesmi.cah.ucf.edu/omeka/items/show/7612.